The fashion market today is not really geared to women who would like to dress modestly. This, however, does not mean that such women should be left with clothing styles from two centuries ago. Simple fashion altering techniques can allow you to take a seemingly immodest outfit and convert it to one that can easily earn you accolades on your fashion sense, without a compromise on your modesty. While some long skirts cover your legs right up to your ankles, they more often than not come with a split at the side or back of the skirt that rides quite a ways up. With skirts like these, pin the split together to see how far you can sew it without the skirt becoming too difficult to walk in. For the remainder of the split, you can choose similarly shaded fabric and sew it in, giving you walking space. Alternately, pick up a completely contrasting piece of printed fabric and sew that into the split. This will give you a whole new look. Or sew in narrower inserts with stretch-knit fabrics, nylon or spandex. Really short skirts with splits generally can’t be sewn together since it becomes difficult to walk in or will look scrunched up. Instead, team such skirts with leggings. Here too, a triangular piece of stretchy fabric can be used to create a modest skirt with freedom for movement. Other options would be to create a layer with a fabric of your choice. So while the top part of your skirt remains denim, the lower half may have a floral print. While wearing leggings is one option to cover an unsightly split, you can also wear similarly colored or contrasting slips on the inside that match another part of your outfit. While you may work on making your skirts modest, accessorizing also goes a long way in bringing about the look you want. For starters, with shoes, the higher your heels are, the less dramatic a split in a skirt will seem. If you are struggling with a particularly difficult skirt to alter or don't have much time, tie a scarf around your waist so that the ends hang over the slit--this can be done with a skirt that has a side slit. 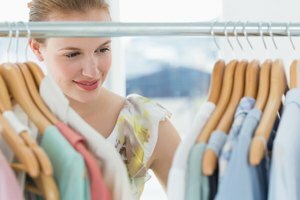 How you select your clothes is also important, especially when your choice is often limited by a range of clothes not meant for you. When limited to a selection of long skirts with slits or splits buy one size larger, as this will give you ample walking room as well as the extra space you need for sewing. Also, a larger-sized skirt may cancel out the need for alterations since the slit may not fall as high on your body size. How Should a Women's Business Suit Fit?